a small plastic card issued by a bank, business, etc., allowing the holder to purchase goods or services on credit. Any fee that is charged on an annual (yearly) basis. 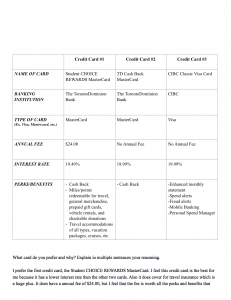 One of the most common occurrences of an annual fee is the fee that is charged by some credit card companies to their credit card holders, simply for having the credit card. The smallest amount of a credit card bill that a consumer can pay, to remain in good standing with the credit card company. Making the monthly minimum payment on time is the least a consumer needs to do, to avoid late fees and to have a good repayment history on his credit report. The grace period is the time during which you are allowed to pay your credit card bill without having to pay interest. The Credit CARD Act of 2009 requires that if issuers have grace periods, they must last at least 21 days. The grace period usually applies only to new purchases. Why would a credit card company let you borrow money? A Credit Card company lets people borrow money because they make a lot of money off the interest that the company gets from the customer that owns the credit card not paying off the whole credit card that month. What card do you prefer and why? Explain in multiple sentences your reasoning. 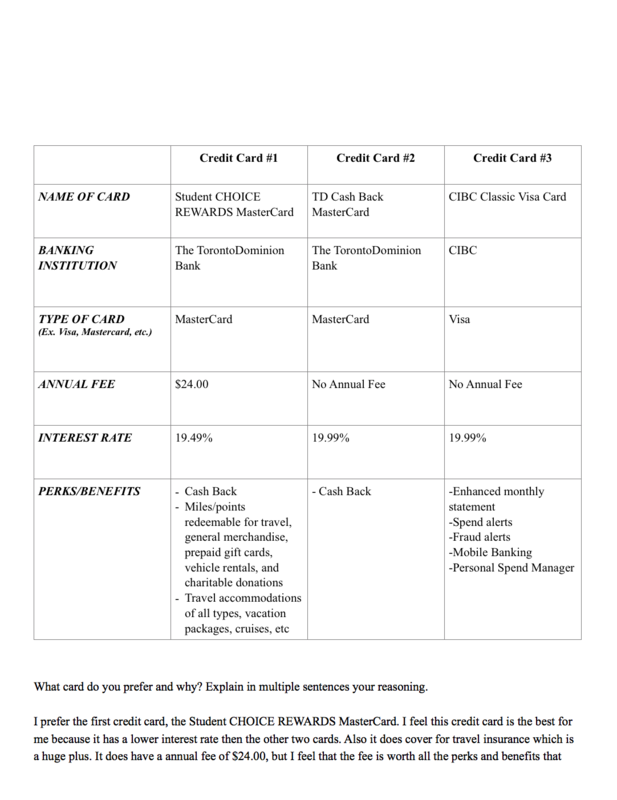 I prefer the first credit card, the Student CHOICE REWARDS MasterCard. I feel this credit card is the best for me because it has a lower interest rate then the other two cards. Also it does cover for travel insurance which is a huge plus. It does have a annual fee of $24.00, but I feel that the fee is worth all the perks and benefits that come with the card. Also when I am 19 I plan on being a student in a University and this card is directed for students which is a good benefit because it would be directed to my life style. What card do you NOT prefer and why? Explain in multiple sentences your reasoning. I do not prefer credit card #2, the TD Cash Back MasterCard. This credit acrd isn’t for me because it has no annual fee which is good. It also has a interest rate of 19.99% with is pretty good. This credit card is very classic though and I can find the same credit card with the same interest and rates, but with way more benefits and perks then the TD Cash Back MasterCard. This entry was posted in Planning 10. Bookmark the permalink.